In the middle of everything and away from it all! Drop in anytime between 6:00 p.m. to 7:30 p.m. on Saturday, December 12 in the Clubhouse! All are welcome to enjoy food and beverages provided by Chick-Fil-A. 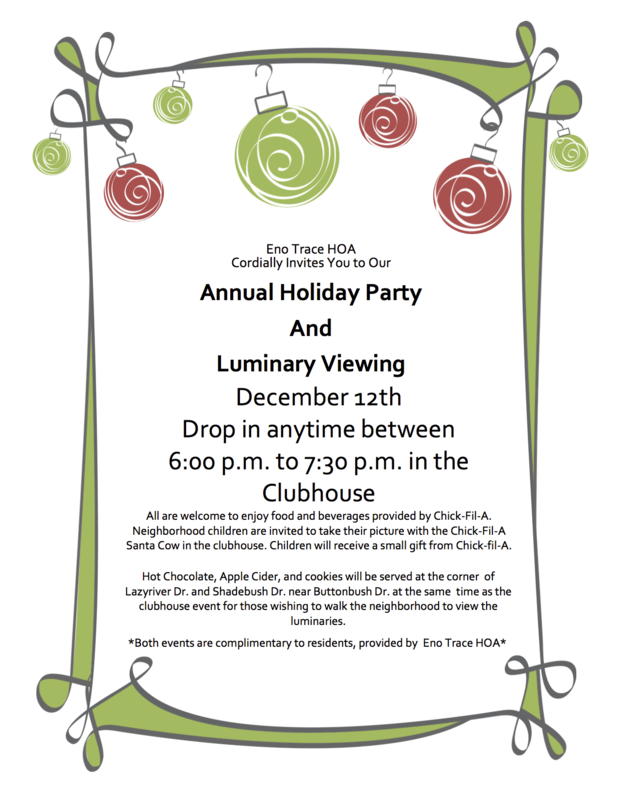 Neighborhood children are invited to take their picture with the Chick-Fil-A Santa Cow in the clubhouse. Children will receive a small gift from Chick-fil-A. Hot Chocolate, Apple Cider, and cookies will be served at the corner of Lazyriver Dr. and Shadebush Dr. near Buttonbush Dr. at the same time as the clubhouse event for those wishing to walk the neighborhood to view the luminaries. Both events are complimentary to residents, provided by Eno Trace HOA.